Radio Shropshire held a fascinating debate on flooding at the Shrewsbury Conference centre yesterday evening. It was certainly worth giving up a Friday night to listen and take part. Owen Paterson, Secretary of State for Environment and MP for North Shropshire. Alistair emphasised the importance of modelling weather, water flows and flood risk. Anthony said that the best way of alleviating flooding is a whole catchment approach, that acknowledges that alleviating flooding upstream will increase risks downstream. Mary called for small-scale practical solutions, including one-way air bricks. Owen Paterson emphasised that there is no single solution. He spoke of Leeds and Lincolnshire but seemed a stranger to Shropshire and its local needs. I spoke of flood risk from new housing development in Ludlow and said that sustainable drainage systems (SuDS) are not enough. We need extreme SuDS. 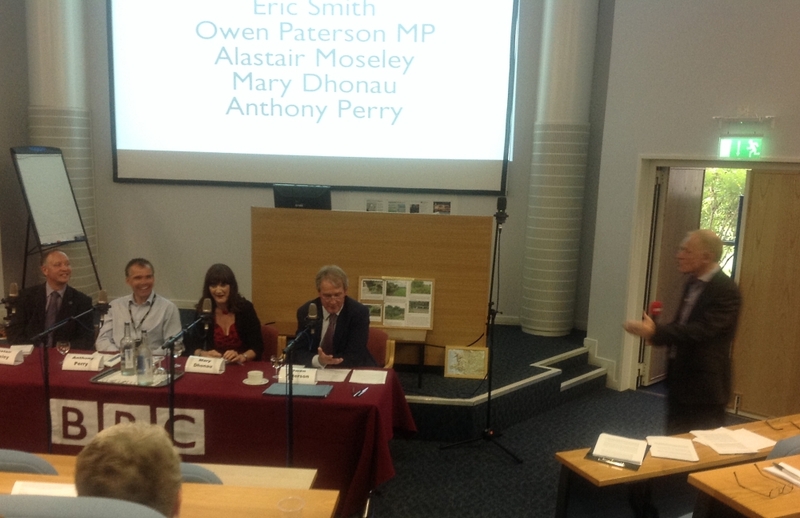 The best single idea of the debate was the proposal from the audience for a flood champion for each county. The debate was recorded live. It will be broadcast on BBC Radio Shropshire on Monday morning, 7 July from 8.30am to 9.30am.